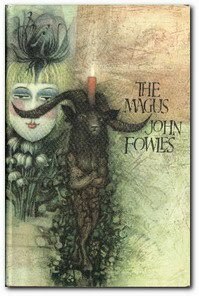 I'm currently reading 'The Magus' by Fowles. It is a somewhat convoluted tale of a rich, super clever psychiatrist who embroils an English teacher on a idyllic Greek isle in a game of mystery, timeshifting, psychosexual tomfoolery. Through it runs a seam of theatricality - literally in the set pieces that are created to confuse - and the reader, like the subjects of the games are constantly left disoriented. Conchis (the 'Magus') is something of a frustrated producer I feel. Notwithstanding that the book actually might make a decent opera (you would need to find identical twin sisters though), the striving to constantly create other worlds and places to which one can take an audience seem suitably in line with the operatic world all of us inhabit professionally. The book proposes that mystery and pretence lead us ultimately to real truths, but that isn't really much of a surprise to those of us who work in theatre and amid all the drudgery of getting the whole thing together we ought to constantly remind ourselves of that particular aim. Culture is mostly make believe and in our scientific, forensic and technological world, it is ever more necessary and therapeutic. The sun greets me at my cafe table. Nice of him to make an appearance although, of course, it could all just be an illusion.